Galatians: a letter that had great importance for the magisterial Reformers (Luther on Galatians is always in print) and in recent years has been at the heart of the the debate on New Covenant theology and the New Perspective on Paul. Mark Johnston brings Paul's letter back where it belongs-with a pastor's heart and unerring clarity he makes this vital Scripture accessible to the ordinary Christian. 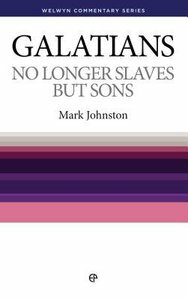 About "Galatians: No Longer Slaves But Sons (Welwyn Commentary Series)"